What happens on a club weekend ? I am often asked this question by new members, apprehensive about their first time out with the club. 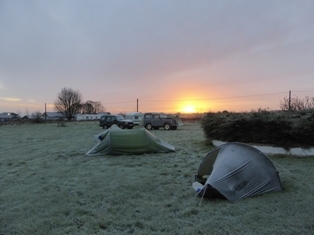 To help beginners, I will describe a typical event, the January Peak District weekend. The Friday night pitch is really the meeting point where members gather from all over, and can park cars for the weekend. 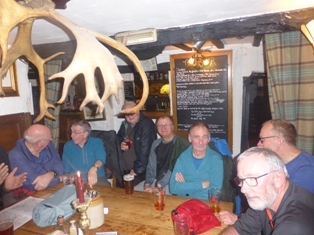 On this event, they came from London, Kent, Hemel Hempstead, Blackpool, Kidderminster, Ripon, Reading, as well as from the Midlands, to the little campsite at the back of the pub in Wetton village. Members can arrive at any time, some may come Saturday morning. I, as arranger (don’t like the term organiser – we don’t organise anybody), wanted to be there before dark Friday afternoon in case of problems to solve, so the other three I travelled with had to be early too. Even then, Ant from Nuneaton beat us to it. 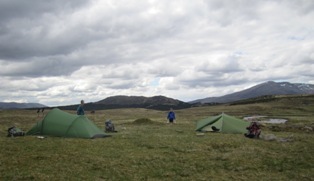 Some others drifted in before darkness fell and we retired to the tents to wait for the pub to open. Several more had quietly arrived by the time we were in the pub, most had ordered meals (so much for backpackers being self-sufficient). At this time, we all knew each other through the club, though two were in their first year, and two in their second year, you see, members are so easy to get on with, in a couple of meetings they are like old friends. Then Bernie (Bernadette) arrived! Her first club meet, very dubious about marching into a pub announcing she intended camping with a load of strangers. She soon realised that we all, as outdoor types, had a lot in common, any differences being readily accommodated, no ‘elitists’ here! Saturday morning, while collecting pitch fees (varied depending on pitch, but around £5-8-10 pppn 2018), the arranger usually does the collecting), I spotted three new faces, the prospective members who had contacted me by phone and email, intending to try out the club. They had been delayed on the M1, arriving 2 hours after their 10 o’clock ETA, but had pitched tent without any disturbance at all. 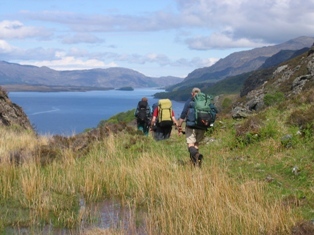 Event arrangers usually provide some sort of information sheet with suggested routes, helpful for beginners or those new to the area, though route selection is entirely the choice of the individual. We do not actually lead walks, but as arranger, I am prepared to lead newcomers if they wish. 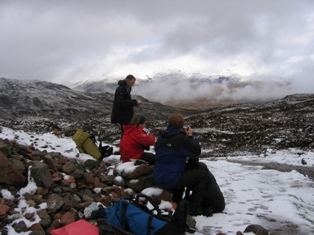 Members start packing away any time from 7.30 to 9.30 in the winter, and drift away in one’s, two’s, three’s, four’s as the mood and coinciding route ideas take them. As arranger, I will be last away, to be sure that everyone is happy with their plans, and no-one is left ‘head-scratching’. This time Bernie, Alan, Ant and I were all last, so we walked off together. 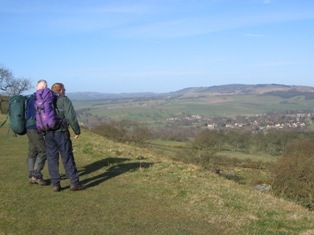 Over Ecton Hill, we could see a group of three on Summer Hill, then we met Malcolm at Ecton but soon diverged again. We stopped at the Hulme End visitor centre for our picnic lunch, Alan was the only one to brew tea. On the Revidge, half an hour’s walk from the Saturday night pitch at Reaps Moor, we bumped into another group of three whose route had taken in Butterton. Just ahead were the three from Summer Hill, and ahead of them were the two with dogs, all groups had taken different routes to here. Winter backpacking entails pitching by 4 o’clock to avoid ‘starlight pitching’ and the three non-members used every bit of daylight. I was relieved to see them, not knowing their abilities. The Reaps Moor pitch is a field at the side of the Butchers Arms with facilities so old, just a tap and a ‘sort-of toilet’, he does not charge us to camp. Meals, though, are excellent and once again, most were indulging. In the Peak District you only need to bring breakfast! Plenty of tales about how the day went were getting taller as the beer flowed. Sunday morning is a repeat process, packing away at differing times, forming groups, discussing routes, where’s the pub, where’s the cafe, etc, and now I’m in a group of six. We cross paths with the non-members at Hartington, then split into two three’s at Narrowdale Hill, arriving back at Wetton within minutes of most others, before the drive back home. This is the most popular format of event, but there are basically two other types The static weekend, using the same pitch two nights for ‘day-walking’, and in wild country often the Saturday night pitch is undefined as most members will ‘wild pitch’ in the hills. There are few rules to abide by apart for common sense, i.e. the Countryside Code, always respecting others and the country we travel on, not bringing the club into disrepute, and you are solely responsible for your own actions. A good way to feel your way into club events is to make contact with your local liaison member to at least ‘break the ice’ locally, and perhaps join forces for the journey to an event.